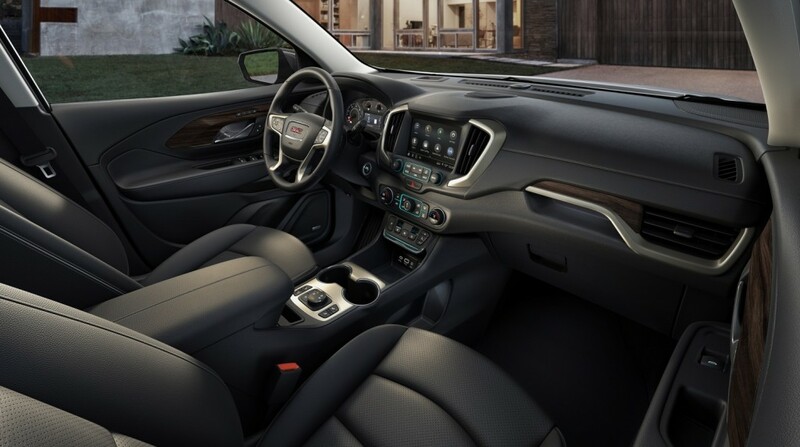 We recently compiled five things we like about the 2018 GMC Terrain, so to visit the flip side, we’re back with five things we dislike. While there is a lot to love and big aspirations for the compact crossover, some things stuck out as chin scratchers. Without further ado. 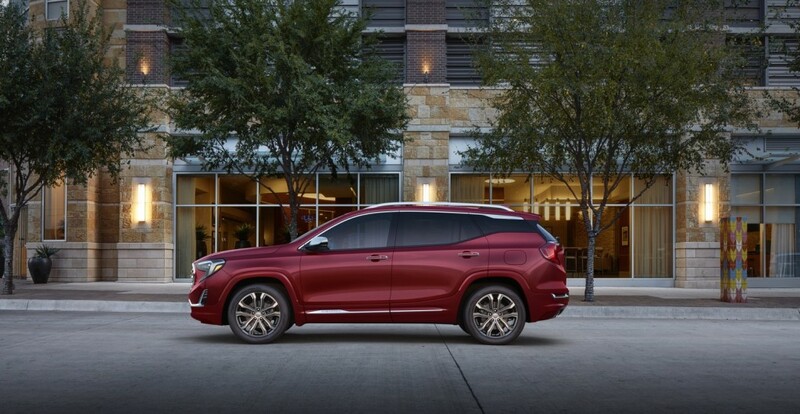 There’s no denying this has been the most controversial move surrounding the 2018 GMC Terrain. We totally get the push-button gear selector frees up space on the center console area, and from an ergonomic standpoint, it really works. However, its execution seems a little off. The buttons look low-grade in quality and are positioned in a strange place for the driver. We also think it’s almost humorous there are still “+ -” buttons flanking the “L” button on the console. Just in case you want to manually shift the Terrain by reaching across the dash. A traditional gear selector or even a dial would have looked much more pleasing to the eye. Upon sitting in a higher-trimmed SLT Terrain, it felt like a nice place to be. From there, we hopped into a Terrain Denali. The differences weren’t too noticeable. If the Denali brand is supposed to exude luxury, the 2018 Terrain Denali’s initial impression did not do that. Similar hard plastics adorned the interior and nothing stood out as a wow factor inside. In fact, we think the SLT’s interior actually looks better. In an effort to express the entire team’s opinions, the floating roofline has landed on both “what we like” and “what we dislike.” While I personally think it’s a distinctive design element for GMC, others felt it looked a tad awkward from certain angles. Only a small portion of the pillar is blacked out for the effect, but it also means your eye is drawn to a very tall shoulder in the rear. It’s understandable how this could be perceived as a tad quirky. It’s likely only a matter of time before nine speeds truly replace six at GM, but we do wish the 1.6-liter turbo diesel would come mated to the new nine-speed automatic. The same is true for the 2018 Chevrolet Equinox diesel, which also sticks with a six-speed automatic. We may be wrong on this one, but from what we’ve gathered, it seems the super handy, programmable power liftgate will be a feature exclusive to the Denali. We think it would be a much-appreciated option on lower level trims of the 2018 Terrain, especially since the interior designs don’t differ greatly. I feel like they could have done the electronic shifter in this way – make the shifter a dial in the center console where the drive mode selector is, then make drive mode selection with buttons on the dash. I REALLY don’t understand why they didn’t do it this way. I hope it gets changed. It probably wont happen for the 18 model year, but we may see a change for 19. Fingers crossed. GM has time to change the shifter before production begins in the fall (September or later). Ford and some imports use the dial shifter, but the Lincoln MKZ has a better pushbutton shifter placed to the left of the center column display, in close reach of the driver’s right hand. Visit the Lincoln web site to see it. That is where I would put it, too. The newer automatics never need constatnt shifting, so any electrical system is better than grabbing a hard rod in your hand! The shifter is not really a big deal unless you want to use the manual mode in the snow or ice. Then it is in a horrible place. Now it is on the shifter and is manageable. The present Denali is not much of an upgrade on a SLT2 as it is now. Many people upgraded and I am not sure why? The no hands Lift gate is just standard on the Denali it will be available on most variations. It is not a Denali exclusive. One of the few exclusives is the heater wheel, some stitching and changes in trim. I think the styling is targeting Honda. I think anyway they did the electric shifter it would receive flak. Weather it be a dial, lacrosse thing or what it has. At least with this version it seems like knowing which gear your seems idiot proof since there’s a separate button for each thing. As for manual mode most people who have non sporty cars do not know what it is or use it. My parents have a grand Cherokee with paddle shifters, my mom has no idea what they are and my dad thinks there stupid “why would you want to shift in this thing?”. The only time I every used a manual mode in and an automatic was to take the curves smoother on a windy road in Yosemite. I don’t think this will be a deal braker. Not the same groups. Whereas many were confused by the design cues of the previous Terrain I loved the ‘change’ from other borrowing vehicles. So I’m good with the idea of eliminating a big shift and replacing it with something smaller, smarter, and elegant. A horizontal row of buttons is asinine. To abandon the up/middle/down thing is pointless design. Power lift gates really need to be standard equipment. 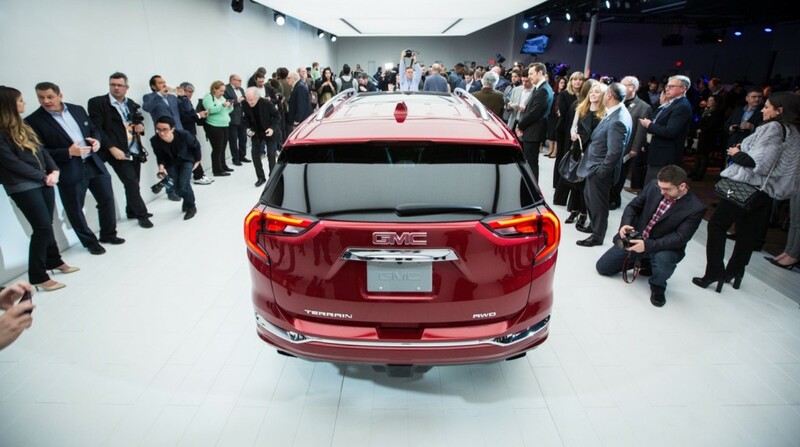 If all the Fords have it available, then they need to make it available in all GM SUV model and trim levels. Power equipment drives wiring harnesses in the plant which is a big deal in terms of complexity. Add $100, make it standard — everyone wins! You can get a power lift gate on models other than Denali, the article is not correct in this aspect. My wife’s current Terrain (SLT) has a power liftgate so I doubt they would exclude it from everything below the Denali. If they do, you can guarantee that someone will lost their job over that. Pushbutton gear selector is going to be a nightmare-My ’05 Avalanche (bought new)-ac/heat push button quit working ~30000 miles. GM would not repair. My 2012 Sierra had the same feature quit at ~18000 miles-would not fix. GM electronics are the worst in the industry. I’M A GM FAN! Why? I don’t know. Then you clearly haven’t owned a Chrysler product. The shifting buttons do seem out of place , Iv’e never owned a vehicle with that type of selector . II understand why they did it but its execution is odd . Also the placement of the SLE and SLT badges , looks like an after thought . I can see some buyers removing them . People buy Denali’s because it’s the best you can get from the Division . Albeit most / all is trim pieces , or getting a smoother ride from the suspension and someone who has terrible back pain its something I appreciate . Wheels that are specific to the Denali , which some like better than what you get on a SLT . The tailight design is also better looking than what you get on the other trim levels . I think the monochromatic look is better suited than the flat black on the bottom trim , in addition to the satin chrome that adorns the bottom of the doors . Plus the different grill design . In the near future you may just see a specific engine as well . Denali’s are a money maker for GMC and sales of them have increased so they must be appealing to many new buyers . Not having the shifter would feel strange because that is where I rest my right hand when driving wiith my elbow resting on the consoles cover . That might be a deal breaker for some and turn towards the Acadia , t has to do with driving comfort . It doesn’t look like there’s a side name plate so how about T E R R A I N on the space below the blackout? Or Denali or Diesel names? I’ve yet to read anywhere the diesel engine will be an option for Terrain, or Danali trim even. They’ve only mentioned the 3 gas engines. Being the Terrain is being built in Mexico don’t assume it’ll continue its past tradition of mirroring the Equinox. There is a significant cost factor involved with adding diesel fuel fill systems inside the plant. Added fuel storage tanks, long lengths of pipes to carry the fuel line side at gas fill and extra fuel delivery trucks entering the assembly plant compound, plus extra racking space lineside to contain the different parts used with a diesel option. All adding costs that must be factored in. The issue isn’t if it’s a little off. A lady isn’t a little pregnant. This sort of situation is PASS/FAIL. As in a triangular steering wheel doesn’t seem a little off but is a FAIL. These gears will be a lawsuit waiting to happen because they slow down the process of emergency shifting. Many moon ago in the Bronx my wife and I were coming off a highway exit ramp. A car tried to pass us on the narrowing ramp despite room for only one car and that we were ahead of them every inch of the way. The honked and surged and honked and tried to pass us. They were creating the illusion we were cutting them off when really all they had to do was stop trying to pass us. When we got to the first city light they parked and four big guys got out. Heading right for us. Since I was at the front of the intersection I simply accelerated (through the red light) to evade these dangerous jerks. If you haven’t gleaned this yet we were about to be carjacked or have our windows destroyed. THAT IS: It was a setup. When I hit the gas I of course didn’t have to touch the shift. Just accelerated and then I took off. Before me was a weird triangular city block. My wife’s job was to eyeball if they were following and where. They did pursue us and it was scary. And this was before cellphones. No cops to call. Luckily it was daytime and other people were witnessing this. There were times where I was dancing around the three corners of this triangular block. Sometimes shifting into reverse so that as they approached I was suddenly behind them. At this point I didn’t care what laws I broke because it might cause welcome police attention. I was making lightening fast shifting decisions that required almost zero looking down. I knew from the feel of things where the shift was at all times. The jerks eventually gave up. With a proper easy to use shift we just made it out of this experience. Having a shift work properly for me is so important I won’t even by those automatics that make you shift thru that weird jaggy shape. If it’s not straight up and down shifting then it’s a FAIL. If this shift was a GREAT idea it would be in the Acadia, Traverse, and all new GM cars. Since it’s a crappy idea it isn’t. Speaks for itself. I would yield in this situation where merging the highway is necessary. If a crash were to happen, then the police would ticket to those that did not yield. Anyone could stop on the off ramp as necessary to yield. I have a 2013 terrain 4 cyl. 6 sp. Gets 31 mpg, the new 2018 with smaller motor and 9 sp.trans and it’s only get 31 mpg what’s wrong on gas mileage………..? My Dad was going to sell me his 2013 Terrain after Mom died a few months ago. (He is unable to drive due to health issues.) After reading about all of the excessive oil-consumption and piston issues on the 2010-2014 Terrains, I decided to wait until the new model came out. BOY, I am REALLY regretting now just taking my chances on the 2013 piston issues. This new vehicle is ugly and not one I will be buying. Sigh. So now I’m stuck going back to car shopping. I had my heart set on a GMC, but am so disappointed in this new model, I will need to look at other brands. Sadly, no other brands really appeal to me, either. The older model Terrains are SO much sharper looking than these new models, too. I saw 2018 today at dealer – Yuk! Hated it!! Will buy a 2017 or look at a Kia Sorento! Suprised no one cared for rear air-vents on the last gen….. okay…. I have 15,000 on my 2018 Terrain SLT, I have had no issues with it, I do not like the low beam headlights. The push buttons do not bother me, The vent in the rear of the console how does it function? Does not seem to do anything. I bought a new 2018 Terrain diesel in April and love it. Well, I’m still not sold on the push button shifter. It could have been something a little better. I do have the power lift gate, that was a must for me. Lately, intermittently, I’ve been unable to lock/unlock the car using the outside door button. Luckily I have the app on my phone. It’s easier than fishing the key fob out of my purse. Told the dealer about it during the last oil change and he claimed he never heard of it.